Bill Cunningham wouldn’t strike the average observer as anyone of note: the octogenarian is usually clad in a blue Costco shirt as he bikes around New York City with a small film camera around his neck, looking for all the world like a harmless retiree on his way to watch a grandson’s ballgame. Cunningham’s unassuming figure, however, belies his considerable clout as one of the foremost street fashion photographers in the world: as American Vogue editor-in-chief Anna Wintour remarked, “We all get dressed for Bill… And it’s one snap, two snaps or he ignores you, which is death.” How does an old man who’s been wearing the same clothing for 20 years end up as one of the most respected fashion recorders of all time and the primary photographer for the New York Times style pages? Cunningham had always loved fashion, remarking in a 2002 article in the Times that his family was at one point “worried I was becoming too interested in women’s dresses. But it’s been my hobby all my life.” His early jobs in the industry included hat designing under his own label, advertising, and writing for the likes of Women’s Wear Daily and the Chicago Tribune. In 1966, a photographer gave him his first camera. That little $35 Olympus Pen-D opened up new possibilities for Cunningham, and he began to visually record striking outfits wherever he went. In contrast to other street fashion photographs being popularized by Vogue or Harper’s Bazaar, Cunningham never focused on celebrities, and often didn’t even notice them: he describes the first time his street shots were published, remarking, “I… had a picture of a woman who turned out to be Farrah Fawcett. I didn’t know. See, I never go to the movies, and I don’t own a television set.” He simply saw beautiful clothing, and recorded it. 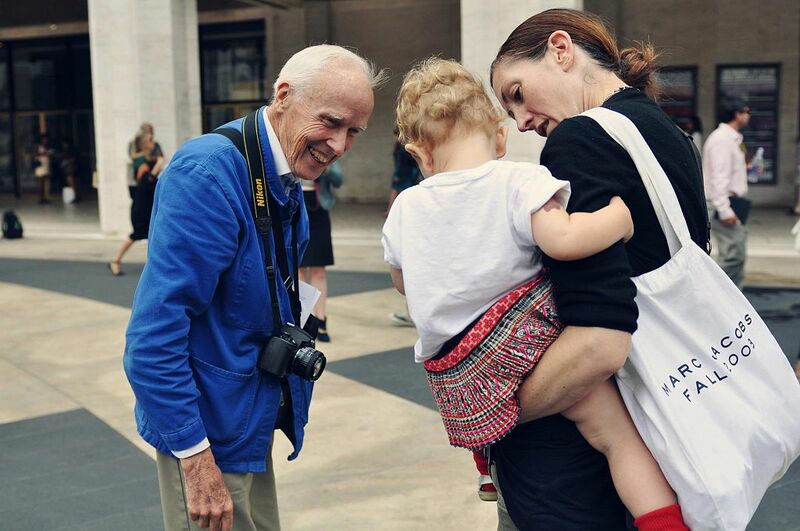 To my mind, Bill Cunningham is the grandfather of street fashion photography. 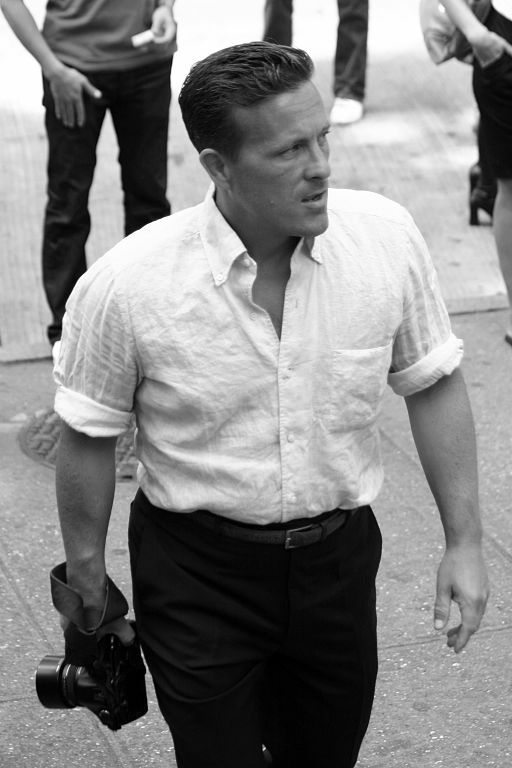 Though he’s now less widely-known than his contemporaries like William Klein or the multitude of imitators who have come after him—most notably Scott Schuman (aka the Sartorialist, who runs one of the most successful fashion blogs in the world)—his impact on the fashion world is indelible. More notable to me, however, is Bill’s incredible character. Bill’s simple, unpretentious clothing choices and his tiny, stark living space (which contains no kitchen or private bathroom) testify to the fact that he’s never let the trends or the money own him. In an industry whose very heartbeat often pulses with fickle fad-following, Bill’s talent, respect for his subjects, and simple love for clothing have helped him gain the respect of the industry’s elite—Costco shirt and all. Bill has had a decisive impact on how I personally view fashion. I’d never followed big designers and was always more inspired by sources like Lookbook, an online community of international fashion-lovers who post pictures of their own outfits. But then a mentor of mine mentioned a 2010 documentary called Bill Cunningham New York, saying that he saw Bill’s celebration of streetwear as a more valid and beautiful celebration of the art of dressing, in that it includes real people with real bodies, and showcases their personal vision for the clothing designers dream up. Within the first five minutes of the film, I was hooked. The documentary, which I can’t recommend highly enough, deeply challenged and encouraged me. In Bill, I found a model of what it could look like to engage an art form I’m passionate about without succumbing to the image-obsession it often encourages in its adherents. That’s not to say I intend to disregard couture designers or the art they produce; as a wise professor once reminded me, everything from the street to haute couture is part of the conversation, and to neglect the “high” end is as impoverishing as to ignore the “low.” There’s a memorable scene in the 2006 movie “The Devil Wears Prada” when editor of the prestigious Runway magazine, Miranda Priestly, coolly chastises her new intern, Andy, for snickering at what seems to Andy like a ridiculous deliberation between two similar-looking belts for a photoshoot. Priestly’s point, if not kindly formulated, is streaked with truth: there is no way to step completely outside the influence of the higher-ups in the industry. Concentrating on street fashion certainly won’t do it; people on the street are wearing things that someone somewhere imagined, designed, manufactured, sold. Regardless of this fact, I believe that the creative anarchy of the street can provide a much-needed balance to the sometimes arbitrary dictations of a small fashion elite, whose whims have historically been imitated without question. And while the elite’s decisions certainly do trickle down to the masses, the average wearers’ choices sometimes defy gravity and trickle up, as well: British designer Vivienne Westwood took many of her line’s style cues from 70s-era punks who wore intentionally destroyed clothing and safety pins in their ears as a way of defying the current establishments. The Anna Wintour quote was pulled from a Vogue news post. All Bill Cunningham quotes come from his autobiographical article Bill on Bill, which is definitely worth reading. The Devil Wears Prada movie quotes were pulled from IMDB. Other facts come from my memory of the documentary Bill Cunningham New York. (Go watch it. Now). 8 Responses to "In Defense of Street Style: Or, why Bill Cunningham and Mother Teresa share space on my list of personal heroes"
Interesting … I do agree that fashion is largely driven from the top down approach at least upper class fashion however, it does also get driven from the bottom as well and so you have a sort of meeting of the two in the middle that sort of falls into street fashion. One thing if anything though that one can say about street fashion is that it definitely accentuates the functional over the ascetic which is something I welcome I partially agree with. After all if were living functional lives and doing functionally oriented things like most people are wouldn’t it be better to be wearing clothing that accentuates that and at the same time being more about wearing the comfortable and easy-going rather than the more beautiful but less functional high class wear. I myself am an advocate of fit and feel over necessarily over the top stylization. I loved reading this article! You are an incredible writer! Very well written article, Whitney! I think I might go watch the dvd. I appreciate that, and please do watch it! I’ve already made this clear, of course, but I think it’d be well worth your while. that devil wears prada quote is very apt. anything the common person who is “not thinking about fashion” is wearing (aside from true fashion punks and true hipsters who, like the teenagers in the 70’s englad, created their own aesthetic through anarchy) comes from some designer, some trend, some runway show that probably happened 15 years before. it’s good to be aware of what we’re wearing, where it came from, who we are influenced by, and how to influence new things. Wonderful blog! Do you have any tips for aspiring writers? I’m planning to start my own blog soon but I’m a little lost on everything. Would you suggest starting with a free platform like WordPress or go for a paid option? There are so many choices out there that I’m totally confused .. Any suggestions? Thanks!